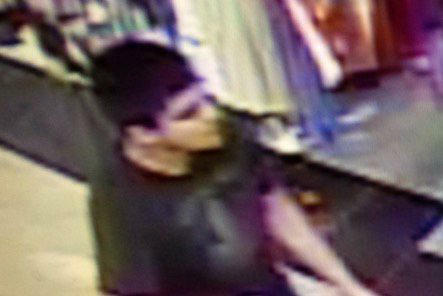 BURLINGTON, Wash. -- A gunman who police said killed five people in a Washington state mall remained at large Saturday as authorities appealed for help in identifying the suspect but said there were no indications the slayings north of Seattle were a terrorist act. People fled, customers hid in dressing rooms and employees locked the doors of nearby stores after gunshots rang out just after 7 p.m. Friday at the Cascade Mall. A helicopter, search teams and K-9 units scoured the area for a rifle-carrying man in a police response that included more than 200 officers. Eyewitnesses said there was panic and screaming inside the mall when the gunshots rang out, CBS News correspondent Carter Evans reports. Authorities said four females, ranging in age from teens to seniors, died after the gunman opened fire in the makeup department of a Macy’s store. An adult male who was wounded in the shooting died early Saturday, officials said. His age was not given and no identifications of the victims were released. Police said they were looking for a man dressed in black and last seen walking toward Interstate 5. The description, including that he appeared to be Hispanic, was based on statements from witnesses, said Given Kutz, a spokesman for the Skagit County Emergency Operations Center. Authorities said the motive was unknown for the shooting about 60 miles north of Seattle. The FBI was assisting local authorities, but Michael Knutson, assistant special agent in charge of the Seattle FBI, said there was no evidence to point to terrorism. Stephanie Bose, an assistant general manager at Johnny Carino’s Italian restaurant near the Macy’s store at the mall, said she immediately locked the doors after hearing about the shooting from an employee’s boyfriend. She said he could see police at the doors with assault rifles. It took hours for teams to search the 434,000-square-foot mall late Friday night. They escorted shoppers and workers who had sheltered in place outside. “It took several hundred to do that...clearing every room, to make sure the suspect wasn’t still on the scene,” Cammock said. The parking lot was closed and emergency management officials told people they would be able to retrieve vehicles Saturday, though the mall said it would be closed for the day. Gov. Jay Inslee said tragedy had struck the state. “We urge residents to heed all safety and detour warnings. Stay close to your friends and loved ones as we await more information and, hopefully, news of the suspect’s capture,” Inslee said in a statement. The Cascade Mall is an enclosed shopping mall that opened in 1990. It features J.C. Penney, TJ Maxx, and Macy’s stores, among other stores, restaurants and a movie theater.